*St Aloysius Gonzaga was raised in this city at his family’s castle. Despite this lofty upbringing he decided to renounce his worldly inheritance in favor of a life as a Jesuit. During his formation in Rome he was never lacking in charity and often spent many hours caring for the sick. On one such occasion he himself contracted the plague. Shortly thereafter at the tender age of twenty-three he passed away. His skull was eventually given to one of his brothers and returned to his family’s castle. Today this relic rests above the main altar of the church located here. *The remains of St Aloysius Gonzaga rest under the altar in the right transept. His rooms are next to the church and can be visited by appointment. *In 1506 a hospital was founded adjacent to this church. It was at this hospital that St Aloysius Gonzaga contracted the plague while caring for the sick. He eventually died from this disease at the age of twenty-three. *The first chapel on the right side of the nave is dedicated to St Aloysius Gonzaga. 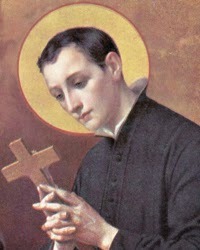 *A statue of St Aloysius Gonzaga is placed within the first chapel on the left side of the nave. *A painting depicting St Aloysius Gonzaga among the plague stricken is within the second chapel on the left side of the nave.